A lot of high-street brands along with brands that are considered higher end will stop their sizing at 5XL. 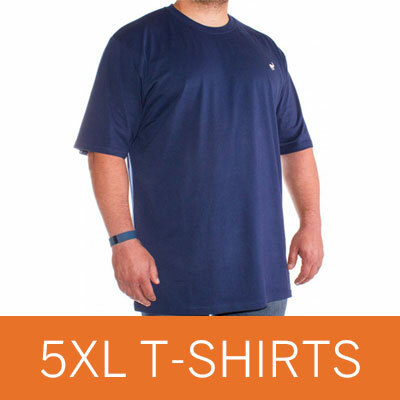 At Big Dude, we will always stock specialist big men’s brand names and ensure that clothing up to an 8XL is always available. 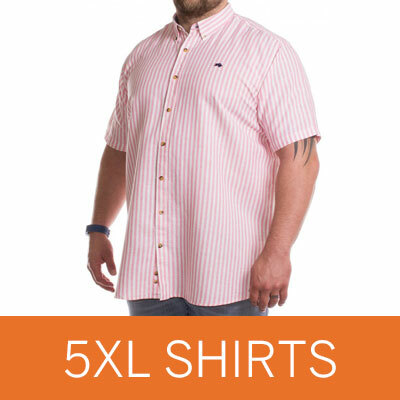 We have found that 5XL clothing is in high demand and we have a great range of over 100 T-shirts and polo shirts as well as jeans, coats and more. We are really proud of our pricing and think it will be hard for you to find better prices on our 5XL clothing. With popular brands including Ben Sherman, Farah and next day delivery options – why shop anywhere else? Whether you are looking for dress shirts from brands like Double Two or casual shirts from favourites like D555, we have it all onsite so you don’t need to go anywhere else to find your ideal shirt. Kit yourself out for the pub, grab a shirt for work or take a look at more formal 5XL pieces, ideal for weddings and funerals. On our formal shirts, the collar size goes all the way through from size 18 to a 23-inch collar and of course our prices are kept as low as possible so you get the best bargain possible on your new shirt. Because T-shirts are really popular, we are always updating this category with new 5XL pieces. Our 100% cotton t-shirts are always in high demand along with plain tees perfect for everyday use, but we have a fantastic range of printed and graphic tees too. Take a look at our XXXXXL T-shirts and browse items from as little as £7.99. 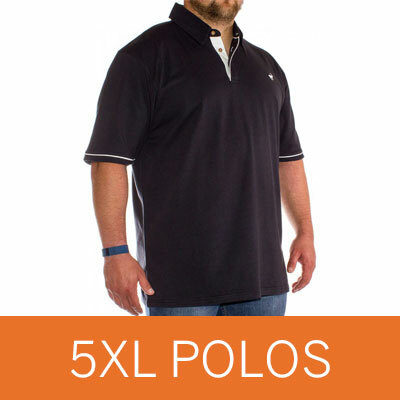 If you are after something a little bit smarter than a T-shirt, then a polo shirt is a perfect choice. Ideal for pairing with chinos for a more formal look or jeans for a laid back, but smart outfit, the polo shirt is a really versatile piece. Available in a variety of colours, in long and short sleeve options and from top quality brands like Ben Sherman, Loyalty & Faith, D555 and Lambretta. Whether you prefer a zip up hoody or the more traditional style piece that you pull over your head, both styles of hoody are available at Big Dude and equally as popular with our 5XL customers. Raging Bull produce some of our favourite 5XL hoodies and the items are always of the highest quality and standards. However, we have a great range of hoodies to suit different budgets and Duke, D555, KAM and Ed Baxter produce good quality everyday pieces at affordable prices. We also stock 5XL jumpers and cardigans throughout the year. Whether you are looking for a navy sweater, a fleece lined jumper or a simple cardigan, we have a great range of 5XL options for you to choose from online. Our jackets are popular throughout the whole year and our lighter summer coats are ideal for taking out and about with you when you’re unsure if it is going to rain. Our range of 5XL jackets are really fashionable and we have a fantastic range of bomber jackets, 5XL Harrington jackets and more. Whether you are after a warm winter coat or a light summer jacket, take a look at our selection of XXXXXL jackets. We have a fantastic range of shorts in a variety of colours and styles from different brands including D555, Espionage and Kangol. Whether you are after a new pair for swimming, some lounging jogger style shorts or some everyday chino shorts, our range has something for you. Take a look at our range of 5XL shorts and grab yourself a bargain with items which start from as little as £6.99. 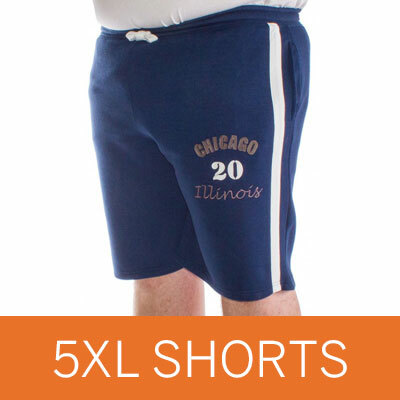 At Big Dude, we like to think that we give you the greatest possible choice in 5XL underwear – boxers and brief included. We stock over 8 different brands in our underwear category and constantly try to improve our choice of boxers, briefs and trunks for 5XL men. Whether you are after 100% cotton, poly/cotton or spandex undies, we stock them all and have great deals on multipack choices. From chest sizes from 48-inch through to 66-inch and waist sizes up to 66-inches, take a look at our 5XL suits, blazers and waistcoats, perfect for that special occasion. Whether you are looking for a light summery blazer or need a full two-piece suit, we have lots of different styles for you to choose from as well as a pick and mix options where you can choose your jacket and trousers separately for a more individual look. If you are on a budget, we have two piece suits for just £99 that have proven very popular – great for everyday wear as well as special or formal occasions.